These exercises focus on the recognition and interpretation of stratigraphic stacking patterns using seismic and wireline-log data from the San Joaquin Basin, California. Synthetic seismograms and facies associations interpreted from conventional help support and provide an integrated stratigraphic interpretation (Tye et al., 1993; Hewlett et al., 2014). In the course of these exercises, you will: 1) identify seismic reflection terminations to reveal key stratigraphic surfaces; 2) correlate key markers and stratigraphic surfaces on seismic and wireline-log data; 3) integrate the above interpretations to define aggradational, progradational and retrogradational patterns to identify depositional sequences and their systems tracts (Mitchum et al., 1977; Posamentier and Vail, 1988; Neal and Abreu, 2009); 4) integrate core, wireline-log, and seismic data to identify lithofacies and interpret depositional systems; 5) predict the presence of potential reservoir and seal strata; and 6) evaluate seal and trapping mechanisms. The two examples are from the Miocene-age Santa Margarita and the Oligocene/Miocene-age Vedder Formations in the southern San Joaquin Basin Tertiary forearc basin (Figures 1 and 2). They allow interpretation of allocyclic stratigraphic-stacking patterns and systems tracts formed in a basin having a ramp-margin geometry that also experienced a high sedimentation rate. Thus, these examples provide a contrast to the well-publicized stratigraphic-stacking patterns developed in a passive-margin basin under similar allocyclic conditions (Figure 3; Posamentier and Vail, 1988; Van Wagoner et al., 1990; Posamentier and Allen, 1999; Neal and Abreu, 2009). 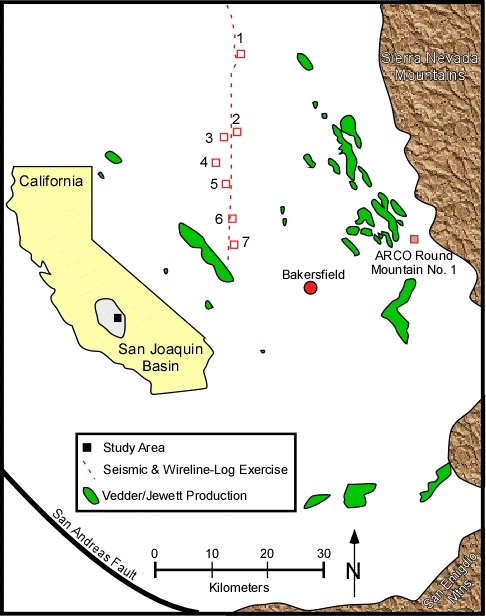 Figure 1: Southern San Joaquin Basin, California, showing well and seismic data exercise locations and a type log for the Oligocene Vedder and Miocene Santa Margarita Formations. Vedder/Jewett Formation oil fields are shown. Figure 2: Southern San Joaquin Basin, California, stratgraphic type log of the Santa Margarita through Vedder Formations. Location of the Santa Margarita well (Well #1) is shown on Figure 1. (2) A low-gradient “ramp” basin that received a large volume of sediment concurrent with base-level changes (Figures 1 and 3). 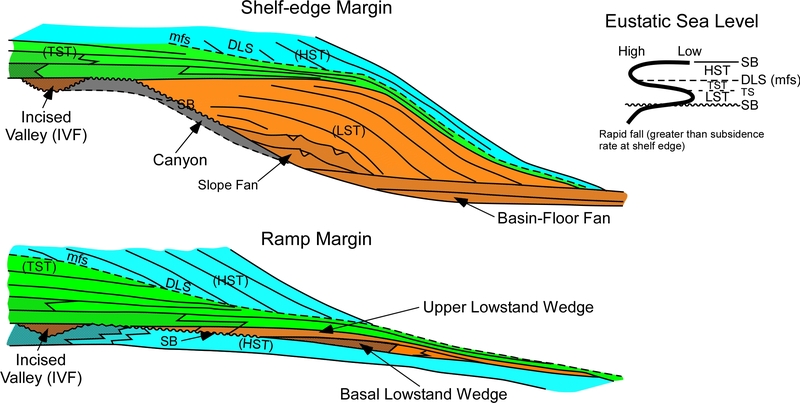 A ramp basin-margin setting generally lacks a well-developed shelf/slope break and a deep basin to accumulate deepwater-turbidite depositional deposits.For comparison,the physiography of a high-reliefshelf-slope basin setting (i.e., passive-margin) provides sediment-transport fairways (i.e., canyons) that feed classic deepwater-turbidite systems; whereas, sediment can be input into a ramp-margin basin via transport through canyons and/or a line source. Figure 3: Comparison of a passive-margin basin having a shelf-slope break (shelf-edge margin) to a ramp-margin basin. System-tract geometries and their lithologic content are largely controlled by basin physiography, sediment supply, and accommodation. Van Wagoner et al. (1991) discuss how parasequence stacking patterns, interpretable from wireline-log data, reveal the long-term balance between accommodation and base-level change. 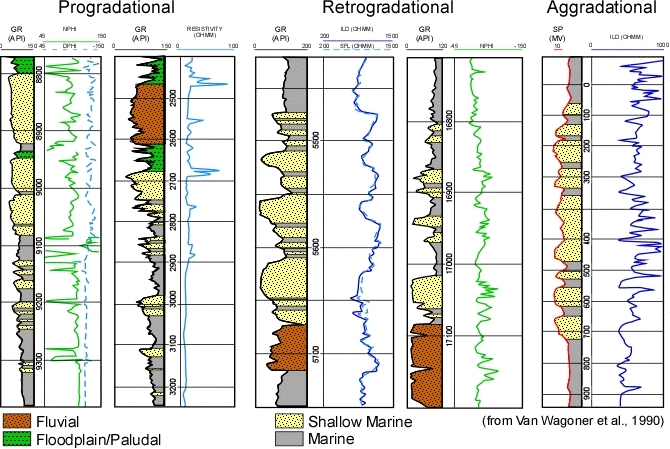 Owing to sediment-supply and base-level variations, genetically related strata show progradational, aggradational, or retrogradational stacking patterns. If the depositional system received excess sediment relative to accommodation, it built basinward (i.e., progradational stacking). If the depositional system received too little sediment to keep pace with increasing accommodation, the system retrograded (i.e., retrogradational stacking), Minimal stratigraphic variation indicates that sediment supply balanced accommodation changes (Figures 4 and 5). Figure 4: Wireline-log expression of progradational, retrogradational, and aggradational stratigraphic-stacking patterns. Vertical changes in stacking patterns reflect the balance between sediment input and accommodation over time. For example: progradational stacking occurs because sedimentation rate exceeded relative sea level change; retrogradational stacking occurred because sedimentation rate was lower than the rate of relative sea level rise; and aggradational stacking occurred because sedimentation rate and relative sea level change were balanced. 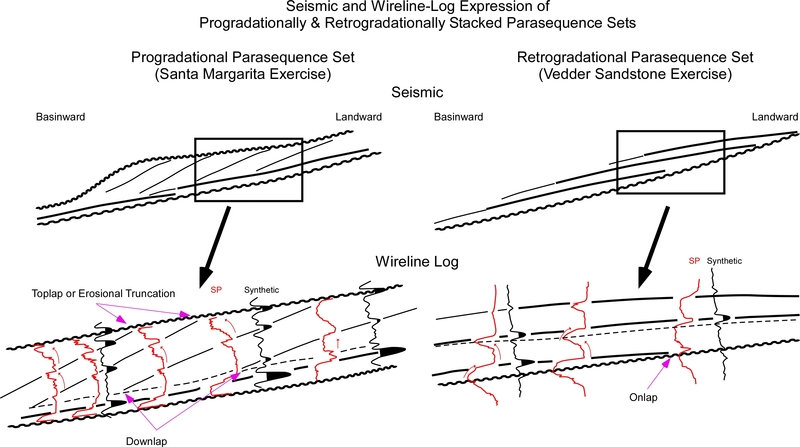 Figure 5: Illustration of progradational and retrogradational stratigraphic intervals as interpreted from seismic and wireline-log data. Blum, M. D. and Törnqvist, T. E., 2000, Fluvial responses to climate and sea-level change: a review and look forward: Sedimentology, v. 47, p. 2-48. Harris, P. M., Frost, S. H., Seiglie, G. A., and Schneidermann, N., 1984, Regional unconformities and depositional cycles, Cretaceous of the Arabian peninsula: in Schlee, J. S., ed., Interregional unconformities and hydrocarbon accumulation, AAPG Memoir No. 36, p. 67-80. Hewlett, J.S., and Jordan, D.W., 1993, Stratigraphic and combination traps within a seismic sequence framework, Miocene Stevens turbidites, Bakersfield Arch, California, in Weimer, P. and Posamentier, H. W., eds., Siliciclastic sequence stratigraphy Recent Developments and Advances, AAPG Memoir 58, p. 135-162. Hewlett, J. S., Phillips, S., &Bazeley, W. J. M., 2014, Middle Tertiary sequence stratigraphy, Southern San Joaquin Basin, California in MP51, in Pacific Section, AAPG, Book MP51, 73 p.
Ketzer, J. M., Morad, S. Evans, R. and Al-Aasm, I. S., 2002, Distribution of diagenetic alterations in fluvial, deltaic, and shallow marine sandstones within a sequence stratigraphic framework: evidence from the Mullaghmore formation (Carboniferous), NW Ireland: Journal of Sedimentary Research, v. 72, n. 6, p. 760-774. Kidwell, S. M., 1984, Outcrop features and origin of basin margin unconformities in the Lower Chesapeake Group (Miocene), Atlantic coastal plain: in Schlee, J. S., ed., Interregional unconformities and hydrocarbon accumulation, AAPG Memoir No. 36, p. 37-58. Mitchum, R. M., Vail, P. R., and Thompson, S., 1977, Seismic stratigraphy and global changes of sea level, Part 2: the depositional sequence as a basic unit for stratigraphic analysis: in Payton, C. E., ed., Seismic stratigraphy – applications to hydrocarbon exploration: American Association Petroleum Geologists Memoir 26, p. 53-62. Pemberton, S. G., MacEachern J. A., and Frey, R. W., 1992, Trace fossil facies models: Environmental and allostratigraphic significance: in Walker, R. G. and James, N. P., eds., Facies Models response to sea level change: Geological Association of Canada, p.47-72. Posamentier, H. W., and Allen, G. P., 1999, Siliciclastic sequence stratigraphy – concepts and application: SEPM Concepts in Sedimentology and Paleontology No. 7, Society for Sedimentary Geology, Tulsa, 210 p.
Posamentier, H. W., and Vail, P. R., 1988, Eustatic controls on clastic deposition II – sequence and system tract models: in Wilgus, C. K., et al., eds., Sea-level changes: an integrated approach, Society of Economic Paleontologists and Mineralogists, Special Publication No. 42, p. 109-124. Tye, R. S., Hewlett, J. S., Thompson, P. R., and Goodman, D. K., 1993, Integrated stratigraphic and depositional-facies analysis of parasequences in a transgressive systems tract, San Joaquin basin, California: in Weimer, P. and Posamentier, H. W., eds., Siliciclastic sequence stratigraphy Recent Developments and Advances, AAPG Memoir 58, p. 99-133. Van Wagoner, J. C., Mitchum, R. M., Campion, K. M., and Rahmanian, V. D., 1990, Siliciclastic sequence stratigraphy in well logs, cores and outcrops: concepts for high-resolution correlation of time and facies: American Association Petroleum Geologists Methods in Exploration Series, No. 7, 55 p.
Weimer, R. J., and Sonnenberg, S. A., 1989, Sequence stratigraphic analysis of Muddy (J) Sandstone reservoir, Wattenberg field, Denver Basin, Colorado: Rocky Mountain Association of Geologists, p. 197-220. Contributed by James S. Hewlett and Robert S. Tye, PhD, P.G.